Plants that flower have a particular need for fertilizer, as they require a lot of energy for bloom production. That energy comes in the form of minerals and nutrients in fertilizer, which are, essentially, a plant’s food. If you want your houseplants to prosper and produce an abundance of vibrant blooms, you will need to feed them. Would you be able to perform an energetic task on an empty stomach? Neither will your plants! The only caveat to this is houseplants that are watered with rainwater. If you collect rainwater to give to your houseplants, then they may not need fertilizing as often or at all. This is because rainwater has naturally occurring minerals in it to help feed your plants. Outdoor plants do much better than houseplants without fertilizer due to the rainwater they drink and also because their roots have the freedom to seek out nutrients in the ground soil. This is in contrast to houseplants, which are obviously confined to the soil in their containers; once they have absorbed all of the nutrients from the soil they are sitting in, then they will have no other access to food (Gardeners World). This is where fertilizer, as well as repotting to freshen up the soil, play an important part of good plant care. There are two basic types of fertilizer: organic and inorganic. Organic fertilizers are those which are produced using natural processes, such as organic compost or manure. Inorganic fertilizers are specially developed substances, which are formed from chemicals to meet the needs of growing plants specifically. Inorganic fertilizers are almost exclusively used by houseplant owners. The reasons for this are threefold. Primarily, people do not use organic fertilizers on houseplants because they have a very strong, offensive odor, which is not appreciated inside people’s homes. Organic fertilizer can also be very unhygienic if it comes into contact with the wandering hands of children or mouths of pets, which is why it is better suited to outdoor use. Lastly, organic compost is physically more inconvenient to use in containers. It is usually large and clumpy, and, therefore, more ideally suited to use outside where you can liberally spread it with garden tools. Inorganic fertilizers are available in several different forms, so you can select which method of fertilizing will best suit the needs of both you and your plant. The most popular methods of inorganic fertilizing are with tablets, granular, liquid, and slow-release fertilizers. Of these, liquid and slow release fertilizers are the most recommended method for feeding houseplants. As with anything, there are pros and cons to using liquid fertilizers. The benefits are the ease of use; you can simply add it to your watering can and simultaneously feed and water your plant. You can also dilute it to your exact liking, adding a very small amount to the water if you are nervous of using too much fertilizer, or increasing the strength of it if you think your plant needs a higher dose. Liquid fertilizer is great because you have a lot of control over it. If you notice your plant is struggling to flower, then you can add fertilizer to your water more frequently and then, cease using it entirely when the plant enters its dormant period. Liquid fertilizer is a very popular method of feeding plants, and, therefore, there are a lot of varieties available on the market. This is good for consumers because there’s such a wide range of liquid fertilizers to choose from, meaning you can find one with the exact ingredients you want for your plant. An array of choice also usually means there’s a broad variety in terms of price range, so everyone can find something that will work for their budget. The drawback of liquid fertilizers is that to benefit from them fully, you will need to remember to use it at the right intervals. If you are a forgetful plant caretaker, then using a fertilizer that is more long-term, such as slow-release fertilizer, might be a better option for you. Slow-release fertilizer does exactly what it says. Each bead of fertilizer is coated in layers of a different thickness, which dissolve over time, releasing nutrients into the soil very gradually. Each brand of slow-release fertilizer has different time scales, with some releasing nutrients over a period of as long as nine months. In this scenario, you would only have to feed your plant once a year, and it would continue to reap the benefits of fertilizer throughout the entire growing season. This would be ideal if you struggle to remember to feed your plant, or if you have a very busy schedule and like to get things done with as little effort as possible. There is a downside with slow-release fertilizer, and that is that you have no control over how quickly it releases nutrients. If you don’t time feedings perfectly, then the fertilizer may continue to release nutrients during a plant’s dormant period, which is not only wasteful but potentially harmful to your plant. Slow-release fertilizer is also more expensive than other types of fertilizer, which can put some people off from buying it. However, as only a small amount will last several months, in terms of expenditure per year, it probably works out costing around the same as liquid fertilizer. If you’re prepared to stump up the higher cost of a slow-release fertilizer, it will serve you well in the long-run, as it will last much longer than an equivalently sized container of liquid fertilizer. The two remaining types of fertilizer, granular and tablet, are designed for use with outdoor plants and do not work so well for container plants. Tablet fertilizers are tablet-sized sticks or blocks of fertilizer that you plant directly into the hole where you are planting a tree or shrub. Due to their larger size, they dissolve over time, releasing nutrients into the soil each time they are watered. Granular fertilizer can be used in containers but works much better for outdoor gardening. You sprinkle the granular fertilizer over your soil, and it quickly dissolves when coming into contact with water. If used for indoor container plants, it’s very hard to control the strength. As it dissolves almost immediately on contact with water, it gives the plant a sudden shock of nutrients but then will need topping up once it has all been absorbed. It does tend to be inexpensive, but liquid fertilizer is available at a similar price point and comes with more advantages for use on houseplants. Generally, houseplants should only be fertilized during their growing season, which for most plants is during spring and summer. During this period, houseplants will have specific fertilizer needs depending on what type of plant they are. Fast-growing plants that produce plentiful flowers, such as a Hibiscus, may need to be fertilized as often as every week. Other plants, usually those that grow slowly, might only be recommended for feeding every month or two during growth season. It’s important to get to know your plants needs when you first bring it home so that you can fertilize it accordingly. Inappropriate use of fertilizer can be very damaging to plants, so don’t use it without checking if your plant can tolerate it. Too much or too frequent use of fertilizer can cause your plant to burn and could even lead to its demise, so err on the side of caution when feeding your plant. Too much fertilizer is actually much more hazardous to your plant than no fertilizer at all, so it would be best to abstain from fertilizer completely if you are unsure how to use it. Or, at the very least, use it sparingly. That being said, most plants are very easy to care for where fertilizer is concerned, and as long as you have researched your plant's fertilizer requirements, then it is an easy task to complete, even for novices. It’s very unusual for a houseplant to need fertilizing during autumn and winter, as this is generally their dormant period; the exception to this is houseplants living in a tropical climate. In cooler climates, houseplants use this time to rest and recover, so you’ll need to allow them to do this by not adding fertilizer to their soil. Plants are generally much less thirsty and hungry during cooler months and have no use for added nutrients. If the plant cannot use its nutrients by growing more flowers or foliage, then the excess nutrients will burn the plant’s roots, causing unsightly marks on the leaves in the form of discoloration or dead areas. Excessive use of fertilizer can also cause a build-up of salt in the soil, which can prevent the plant's roots from absorbing the moisture it needs. This is when overfeeding a plant can kill it (University of Illinois Extension). If you have more than one houseplant in your home, attempting to feed them on different schedules can quickly become very complicated. To prevent getting confused about which plant needs feeding when, you would be better off using a general feeding schedule. The time for the first feed of the year for your houseplants will vary depending on your location and local weather. Give your plant their first dose of fertilizer eight weeks before you expect the last spring frost. For example, if the last spring frost usually occurs in the middle of May, then your first houseplant feed of the year should be in the middle of March. For this feed, you should use a diluted dose of half the recommended strength or less. At this time of year, the plant will be slowly shifting into its growth period after its resting state, and the lower dose will help them gradually get ready for a more active growth period. As the plants are just emerging from resting state, they will not need and will not be able to tolerate higher strength applications of fertilizer. As summer approaches, you can begin a regular feeding schedule, which will be dependent on your chosen fertilizer type. Liquid fertilizers will need to be used most often, usually every week or two, while granular fertilizers are usually advised on a monthly basis. Slow-release fertilizers can vary dramatically, with some lasting three months between each use, and some lasting as long as nine months. Irrelevant of whether you keep your houseplants indoors or outdoors during summer, they will need to be consistently fed according to your fertilizers instructions. Houseplants enter their growing phase in line with the number of sunlight hours they get, which will be longer during summer months wherever they are situated. Around eight weeks before the first frost arrives, you should dilute the fertilizer to half the strength and gradually taper feedings down until you are not feeding it at all. These diluted feedings will work in line with the plant preparing itself for its resting period over winter. Houseplants should not be fed at all over winter unless you live in a tropical climate, in which case, you can continue to feed all year round on a summer schedule. Getting to grips with fertilizer ingredients will serve you and your houseplants well. Some plants need very specific care, such as orchids. For these plants, manufacturers have made plant care easy for you, and you can simply buy a fertilizer labeled ‘orchid fertilizer.’ Other plants have less specific requirements, and you might need to know which ingredients your plant is likely to favor. As a rough guide, leafy plants will want a fertilizer high in nitrogen. Nitrogen supports the growth of healthy foliage and will result in a lush and full looking plant. Plants that produce flowers will need a fertilizer that has a higher content of potassium, sometimes also called potash. Potassium encourages plants to bloom, resulting in a healthy display of flowers on your houseplant. Phosphorus in fertilizer helps roots to develop and grow, so this is an ingredient to look out for if you are trying to get your plant to grow in size. And the same applies in reverse if you are not interested in your plant growing to be too much bigger; look for a fertilizer that is low in phosphorus. Nitrogen, potassium, and phosphorus are the primary nutrients found in fertilizer, as they are the basics that your plant will require. If you spend more money on a higher quality of fertilizer, you will usually find that other ingredients are included, such as the micronutrients magnesium and boron, which contribute to healthy plant development. The type and level of growth your plant experiences as a result of fertilizer use will depend on the percentage of nutrients in the fertilizers ingredients. Each container of fertilizer will have three numbers displayed on the box, and these numbers refer to the number of essential plant nutrients inside. The first number refers to nitrogen (N), the second number to phosphorus (P2O5), and the third number to potassium (K2O). The formation of these numbers will usually be displayed as ‘00-00-00,’ with each number referencing the amount of the nutrient found in the fertilizer. If you want rapid growth, look for fertilizers with high levels of nitrogen. Mass flower production will require high levels of potassium, and root development will require higher levels of phosphorus (SF Gate). Fertilizers are often referred to as ‘NPK fertilizers,’ which is referencing the three essential nutrients and main ingredients: N for nitrogen, P for phosphorus, and K for potassium. Types of growth will be wholly dependent on the levels of these nutrients in your chosen fertilizer. 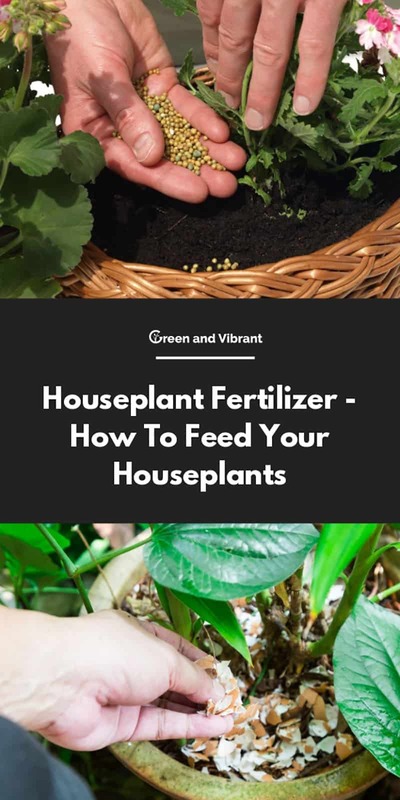 Providing you use fertilizer appropriately, it is a very easy and inexpensive way to really get the best out of your plants. There are plenty of fertilizer options available, which means you can be as picky as you like, choosing a fertilizer and feeding schedule that perfectly suits both you and your plants. Specialist blend fertilizers can be bought by dedicated houseplant growers who know in depth what their houseplants need, while casual houseplant owners can keep things easy by selecting a general all-purpose houseplant fertilizer to improve the health and growth of their houseplants without making things too complicated. Gardeners who enjoy spending time tending and caring for their plants may like to opt for a liquid fertilizer that they can have total control over, while gardeners who prefer a less demanding houseplant care schedule can choose the much less labor-intensive option of slow-release fertilizer. Given how simple fertilizers are to use, and the dramatic effects they have on houseplants, there’s no reason not to use them. Share this article with other plant enthusiasts you know and let us know of any fertilizing tips you’ve come up with in the comments sections below!